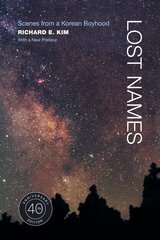 March 2011 marks the publication of UC Press’s 40th Anniversary Edition of Richard E. Kim’s classic novel, Lost Names: Scenes from a Korean Boyhood. Kim paints seven vivid scenes from a boyhood and early adolescence in Korea at the height of the Japanese occupation, 1932 to 1945. The book, which was praised in the New Yorker, the New York Times Book Review, and elsewhere, takes its title from the grim fact that the occupiers forced the Koreans to renounce their own names and adopt Japanese names instead. The 40th Anniversary Edition includes a never-before-published speech by Richard Kim, given at the Fiftieth International PEN conference in 1987. Kim’s estate has granted us permission to post a portion of the preface on our blog. Read the excerpt below, or download a longer PDF version. This spring Kim’s novel The Martyred will be published by Penguin Classics. Richard Kim is the first Korean American writer to be included in the series, and The Martyred is the list’s first title dealing with the Korean War. To begin with, let me tell you that this is one of the best-organized conferences that I have had the pleasure of participating in (and I have been to many). For that I would like to thank the organizers and the staff. I would like to thank the British Council of Hong Kong and the Department of English of Hong Kong University for creating the idea of this conference in the ﬁrst place. I remember writing to Jill Martin and commending her and all those involved in organizing this conference for the very idea of hosting a conference of this nature. And I would also like to thank this conference—from a very personal point of view—for inviting me to participate in it because the invitation helped me—in a rather unexpected way, I confess—to clarify and deﬁne to some extent what I think of myself by understanding what others seem to think of me. I am an American and have been one for more than a quarter of a century—but, as you all know, appearances can be deceiving…. I live, and I have lived for more than twenty years, in a very liberal, small academic town in what must be the most liberal state in America—Massachusetts. That—after all those years of my academic life as professor of English at the university in his town. I merely mumble something to the effect that I am, well, studying life, sort of. Then there is this blue-eyed, blonde, lady bank teller who asks me where I am from—the sort of question no one ever asks my blue-eyed, brunette wife of Danish-German ancestry. Well, it has been also like that for me in the States in my relation with the so-called American literary establishment. I remember that when my ﬁrst novel, The Martyred, was published in New York I was simply presumed to be and was presented as a Korean writer, and, no one, including myself, minded that—except the Koreans in Korea, especially Korean writers and critics who felt that since I wrote in English I lacked proper credentials and legitimate claims to be a Korean writer. In fact, a professor-critic there who made his living mainly by putting out anthologies told me in all seriousness that when I ﬁnally wrote something—by God, said he, anything— in Korean, he would certainly include me in one of his literary anthologies. To this day, I am not considered, so I am told by Korean writers and critics, to be qualiﬁed as a proper Korean writer. So it went till my third book was published in the States, when Professor Edward Sidensticker, an eminent authority on Japanese literature reviewing the book most favorably, referred to me as Richard Kim of Korea, whereupon the progressive, liberal staff of the New York Times Book Review listed the book in the Review’s list “Editor’s Choice” and deﬁned me categorically as a Korean-American writer. The dawn of hyphenated Americans (not all of them, mind you) has arrived. But, that, of course, made the Korean writers and critics more adamant than ever about my literary status (or nonstatus). Now, really, all this is quite silly, but what it all seemed to signify was that, from a literary point of view of categorizing writers, I was a very inconvenient writer indeed—both to the Koreans and to the Americans. Well, I really was too busy doing this and that nonliterary thing to care much about all that, but I did want to look into this business of my Koreanness, so to speak, just to see, if for nothing else, if I could also write in Korean. To make a long story short, it did turn out that I could indeed write in Korean, and thank God for that, and that was that. That is, as Dr. Han Suyin has remarked the other day, I could just think of myself as a writer at peace with the world, the whole world, in diverse cultures and languages, and let the literary intelligentsia and academicians worry about the rest. And yet the very theme of this conference, not so much about “in English,” I confess, as about “Asian Voices,” has made me realize that, at last, I have now found one unequivocal, unchallengeable claim that I can make about myself, about my literary status and identity—I am an Asian writer. How nice! Now, to this matter of “in English.” I do write in English, more so than in Korean, and I think I can say that I am one writer who is madly in love with the ﬁrst-person “I” of the English language—from the point of view of the metaphysics of Being. The joy, excitement, and wonder that came to me when I ﬁrst discovered the impact of the “I” in English—and I am sorry it is all so personal, not intellectual, that I really can’t go into it all at this point—well, it was like when, on my maiden voyage to the United States, in the middle of the vast Paciﬁc Ocean, I came, alone, face to face with the sun emerging from the waves on the morning horizon . . . and it was then as if I saw the sun for the ﬁrst time in my life, it speaking to me and I speaking to it. And with all that came also my fascination with the relative pronouns of the English language. I don’t know about other writers whose native tongue is not English, but, for me, the relative pronouns of the English language forced me to think, to reason, to qualify, logically and rationally—in short, to make myself clearer to myself and to others. Thank you, whoever you are, for inventing the relative pronouns of the English language. Now, what I am going to say and do in the remaining hour could not have been possible, I assure you, if I had not begun my writing life in the English language. I mean not only that I couldn’t have thought, written, and said it in the Korean language exactly the way I wanted but also that I couldn’t have, perhaps, arrived at certain points intellectually and psychologically had I not been writing in the ﬁrst-person “I” of the English language with its metaphysical implications.